The quartz used for viscosity measurements is cut out of a synthetically produced single-crystal. This type of crystal is applicable for high temperatures (up to 500°C) and high pressure (up to 10 kbar) viscosity determinations and is furthermore characterized by its high chemical resistance. 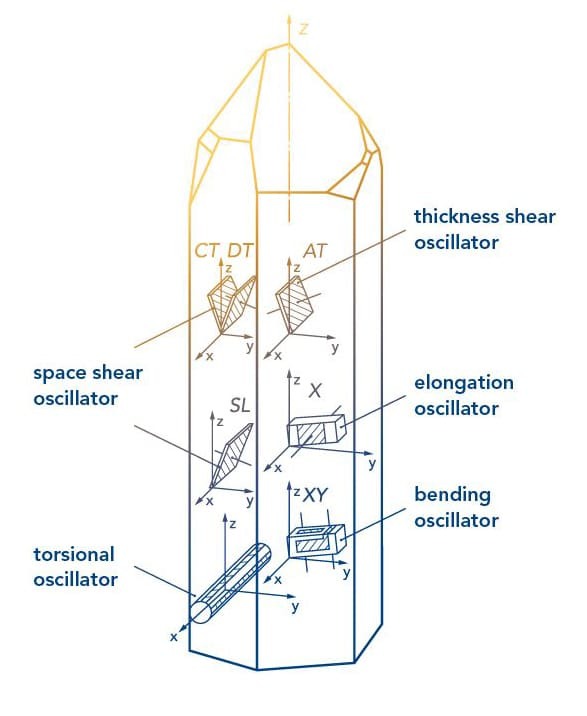 The quartz crystal used for the QVis sensor is a so called torsional oscillator. A torsional oscillation is generated when an object is twisted/distorted; with the QVis, the creation of an electrical field causes such torsional oscillations. It should be noted that only torsional oscillation can create perfect shear stress within the liquid which is an essential precondition for an accurate determination of viscosity. The oscillating of the sensor causes a high-frequent shearing (approx. 56 kHz) of the measuring fluid. At the same time, the energy input into the measurement substance is comparibly low (significantly smaller than 100 mW).